While the Salem Witchcraft Trials were going on in Massachusetts, U.S.A., in the 17th c., something similar was occurring in Iceland. The superstitious era is documented at the Museum of Icelandic Sorcery & Witchcraft in Hólmavik. 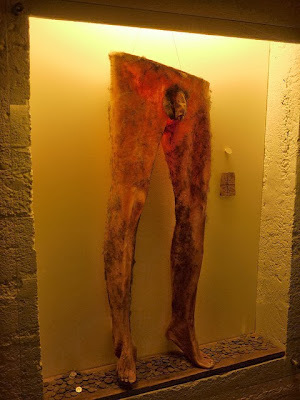 Among the items on display is the world's only pair of nábrók (IMAGE ABOVE), which has been translated as necropants. To make a pair, one did not have to strike a deal with the devil, just with an acquaintance. After he died, he would be exhumed, the bottom half of his body flayed, and his skin worn to reap good fortune. If the correct procedures were followed, the riches would accumulate in the scrotum! I have my brother-in-law Nicholas to thank for this link, rather than what I thought was my extensive research on anthropodermic items.